The topic of electromobility has been on my mind for a long time (e.g. link to the article “Renault Zoe”) and if the matter with the public charging infrastructure were more coherent for me, I would definitely have an electric car. But until then, I’d like to get a little involved with short-distance electromobility and find out for myself how my everyday life changes with an electric one-person means of transport. I have decided after a long information phase for a Ninebot Elite E+. The device is based on the classic “Segway” and is manufactured by the company Ninebot, which bought Segway in 2015 and now produces personal transporters in the medium price segment for the wider masses. The Ninebot Elite is one of the few vehicles of this design that are approved for road use in connection with a moped license plate. This point was personally very important to me, because if you look at the experiences of other owners of personal transport means, then curious inquiries of the police are nothing unusual and then you should have the appropriate papers ready. In addition, the question of liability for damage to other road users is thus regulated. What can be said about the device now, after some driven km? A short briefing and a few minutes of independent and cautious driving have made you get used to the device and you dare to drive faster. In my opinion a very, very intuitive and quickly learnable means of transport. 20km/h don’t sound like much on paper. Nevertheless, it feels pretty fast during the trip and in my opinion it is quite sufficient. It is still Safety First! The large 620Wh battery has a range of 30km. However, this depends strongly on the weight of the driver, the speed driven and the continuity of the track profile. As with a car, constant braking and acceleration as well as fast driving cost more energy. I think, if I calculate with a range of 25km, I will definitely reach my goal. I estimate that the range is easily sufficient for all errands and excursions. I estimate that 80% of my cases of use will take place within a 10 km radius of the place of residence. But the remaining 20% I would like to be able to take the device with me in my car. E.g. for small excursions or to park outside the city and drive the remaining few km into the city. For transport, the handlebar can be loosened with a screw and the two parts can be stowed separately in the trunk. The weight of the main module is quite high at 23kg but in my opinion practicable enough to lift the part into and out of the trunk. The classification of this type of vehicle in road traffic, which is subject to the relatively new Mobility Assistance Ordinance (MobHV), is somewhat more complicated. Despite the insurance sticker, the vehicles are more similar to bicycles with small restrictions than to mopeds. Many people think that a moped is not allowed to be ridden on bike paths because of the license plate number. But that’s where they should be, if there is one. Country roads, motorways, sidewalks are taboo. One battery charge holds 620Wh with the largest battery available and lasts for about 25-30km. Without calculating the charge loss performance, there are costs for a battery charge of 0.17€ Which, extrapolated to 100km, amounts to about 0.68€. You drive purely electrically but a certain noise emission cannot be avoided because of the gearbox. In the beginning the noise disturbed me a bit but the more I stay with the device among other road users the more valuable the noise becomes to be perceived. Anyone who has ever driven an electric car in the city without any noise emission knows what I mean. Personally, I am still disturbed at the moment by the feeling of being watched by everyone with a mixture of unbelief, astonishment and amusement. I think most people have seen the conventional Segways at least once before. Nevertheless, you are a real exotic with the equipment in road traffic and you have the feeling of driving all the time. My greatest fear, however, of not being accepted on the bike paths has fortunately failed to appear so far. How I will handle the device in the future I do not know yet. The hope is that a large part of my short distances can be covered by the car. After almost a year, I’m back with sad news. The mainboard of the Ninebot said goodbye from one day to the next. 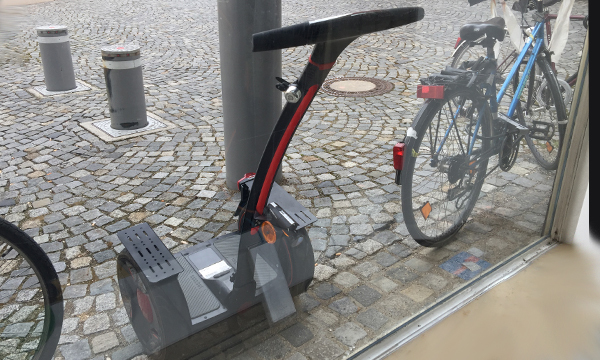 Super annoying, because this makes the Ninebot worthless and I could only sell it for a few hundred Euro. The Ninebot didn’t start the error code “37” anymore and just beeped. Very bad Ninebot!